A seemingly random series of terrorist attacks starting with a massacre within a Derbyshire village threatens to destabilize a fragile government. MI5 are in the thick of the enduing intrigue, protecting the security of the nation and the insecurities of its rulers in equal measure. Meanwhile over at Slough House, the dumping ground for failed spooks (aka the Slow Horses) and personal fiefdom of Jackson Lamb; it appears that Roderick (Roddy) Ho has got a girlfriend, and someone wants to kill him. Plagued by personal demons and prone to snatching disaster from the jaws of mediocrity the Slow Horses are about to ride again. 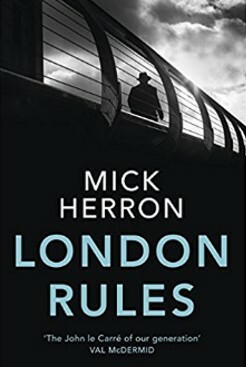 It seems like sacrilege to call another writer the master of spy fiction while John le` Carre is still on the active list, but Mick Herron is shaping up to fit the role. His novels about the second division spies of Slough House manage to honour the traditions of the genre and say something bleakly comical about the state of modern Britain. This fifth outing is perhaps the best yet, taking things even deeper into the netherworld behind the grand frontage of the establishment (a place where every friend is an enemy in disguise and truth is the first casualty of getting the job done). As ever, London is as much a character in Herron's writing as forties LA was for Raymond Chandler. His human characters are equally well drawn, sunk deep in the private purgatory of their own failings, yet together they from a sort of solidarity with the rejected. The plotting is seriously sharp, skewering the self-serving antics of populist politicians, hack journalists and the clowns running what le` Carre called the ‘Circus’. Herron gives his characters whip-crack dialogue that is both cruel and funny in the same sentence, like an episode of Friends with the optimism bashed out of it. This is indeed a book to gulp down in a single sitting, then return to again to savour the nuances of pathos and cynicism you missed first time round. Whoever would have thought it possible to make such a stunning success out of writing about failure?